I enjoy reading as little as possible about a movie before watching it, avoiding preconceptions and leaving it open to be surprised. 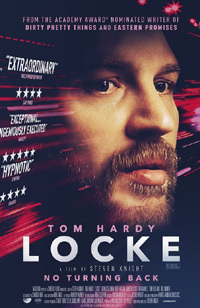 In this case it was well worth it, as Locke delivers a compelling single-character / one-location-driven drama that draws you in and keeps you there. (Written and directed by Oscar nominated screenwriter of Dirty Pretty Things and David Cronenberg's Eastern Promises), the talented and diverse actor Tom Hardy lays down an amazing performance as a man whose perfectly set successful family and work life takes a serious u-turn, when a secret he has been keeping forces him to take a drastic step and do the right thing (but with the potential for disastrous consequences all-round). I already feel as though I’ve said too much in revealing the details of this compelling piece, as I’d like everyone to get the intricacies of the story fed to them piece by piece and not necessarily be surprised for surprise-sake, but get to live these unfolding revelations along with the character (as I did). It is not a crime caper, not a super hero action spectacular, but rather a seemingly simple, but absolutely engrossing piece of cinema that, like a great one act play, manages to keep your attention nailed as you experience the character’s dilemma along with him. This is another example of how you don’t need the budget of a small country’s GDP to create an effective, mind-blowing and ultimately entertaining movie.